Start with a waist-, or thigh-, length light-weight, white, cotton vest. If it has three-quarter length sleeves, like Tom is wearing in the picture below, it is called a hakui. If it is sleevless, it is called an oizuru. In both cases, this represents a henro's burial shroud as traditionally this is what you were buried in if you die while on the trail. The better robes will have Namu Daishi Henjō Kongō written in kanji on the back. When you buy them, they aren't called 'hakui' and 'oizuru.' It seems they are both now called 'hakui' — with sleeves (sode ari) and without sleeves (sode nashi). On the head you wear a henro hat (sugegasa) — a conical-shaped hat made of straw about 18 in (45 cm) in diameter. Since the quality has gone down over the years, they no longer keep water out so you also need to buy the plastic cover that is made to go over the top of the hat. The hat represents the henro's coffin as it would be laid over the body when it was buried. There will be 5 lines of kanji written on the hat: "dogyo ninin" will be one line, then four others that make up a poem, of sorts. In addition there will be one solitary sanskrit character, the character for Kōbō Daishi. When you wear the hat, always wear it with this one sanskrit character facing forward. Around the neck you wear a cotton or silk scarf (wagesa) about 2 feet long and 3 inches wide (60 cm x 8 cm) and usually purple, orange, or green in color. This is the layman's version of a priest's robe (kesa) and indicates to others that you are on a religious journey. 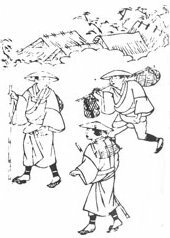 All henro carry a walking stick (kongōtsue) no matter which other pieces of the outfit they choose to wear. It is even carried by those who wear no other forms of traditional clothing and by those who travel the trail by bus. While you can buy plain, unadorned sticks, the most common will have something written on them, like the the Heart Sutra and/or "Dōgyō Ninin." The better, and more expensive walking sticks have a brocade cover (tsue kabā) over the top handle portion like you see on the kongōtsue that Tom is holding in the picture to the left. This brocade cover usually has a small 1" (2.5 cm) spherical bell hanging from it. The intent of the bell is to keep pulling your attention back to the present; back to reality and what you are doing so that you don't just day dream all day as you walk. The walking stick represents Kōbō Daishi so you must take good care of it. When you stop for the night, whether at an inn or not, the first thing you do is wash the bottom of the stick (symbolizing washing the Daishi's feet). After doing that you can take care of yourself. The walking stick should be kept in the tokonoma (if there is one) of your room overnight. The kongō tsue also symbolizes a henro's gravestone as it would traditionally have been placed at the head of the grave if he died and was buried along the trail. One other note about the walking stick. It is tradition not to let the walking stick touch the ground whenever you are crossing a bridge. This tradition comes from the fact that Kōbō Daishi was forced to sleep under a bridge one night (see information for Bangai Temple 8) because he couldn't find lodging anywhere else. The Daishi's spirit still sleeps under bridges along the trail, as the story goes, and while crossing those bridges your walking stick will make a lot of noise and disturb him - if you let it touch the ground. On bridges, hold the kongō tsue off the ground. In addition to the bell on the handle of your walking stick, many henro hang a slightly larger bell (jirei) on their backpack, fubasami, or belt-loop as they walk. The purpose of this bell is the same as the bell on the walking stick. But, it is a little larger and, therefore, a little louder. This should keep you even more focused on what you are doing. I'm still using the same bag i bought back in '99 when i knew nothing about the henro and i have always called it a fudabasami. Looking at a catalog as i type this, though, i see that what i have is a zutabukuro. It's a smaller white cotton bag (half the size of what Tom has in the picture above), with the long neck strap but no internal pockets or compartments, and with velcro holding a flap closed over the top so nothing falls out. On the front of that flap are the words Dōgyō Ninin and the Sanskrit character (bonji or shushi) associated with Kōbō Daishi. I prefer my zutabukuro because it is noticably smaller than the typical fudabasami — just big enough for my nōkyōchō, the map book, candles, incense, osamefuda, and whatever candy i receive as settai from time to time. There is no extra room, and yes, stuff does get crumpled, broken, etc. from time to time. And, finally, the rest of your clothes should be white. Well, that's what i used to say, pre-2016/17. It seems that most people no longer worry about wearing white clothes now. Yes, the hakui and the fudabasami/zutabukuro will still be white, but trousers, shirts, and hats will be seen in all colors. There is no attempt by walking henro to walk in predominantly white colors any more. Wear anything you want! Of course, there are other items that a completely outfitted henro can carry, but anything in addition to what is listed above seems to be extra. These "extra" could include: a buddhist rosary (juzu or nenju) for use at the temples (Some people carry it wrapped around one of their wrists throughout the day); tekō, cotton covers worn over the back of the hands; kyahan, cotton gaiters to cover your ankles and the top of your boots; and even possibly jikatabi, white, cotton socks with a pocket for each toe, worn when you also wear waraji, straw sandals, instead of boots. Let me stress, though, that you don't need to carry or wear any of the above to be a henro. What i have listed above is simply what has come down through history as the traditional dress. A i mentioned on the previous page, one of the nice things about this pilgrimage is that there is nothing that is considered right or wrong. Anything you wear can be considered more or less traditional, but not wrong. I wore a light colored hat, but not the henro hat. 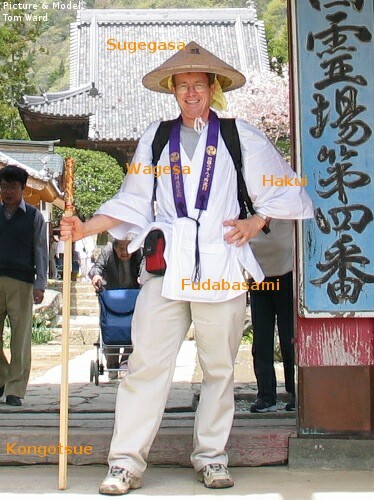 In 1999 i didn't carry the fuda-basami as i kept everything in my back pack, although starting in 2004 i did carry one. In 1999 i didn't wear a bell on my belt, but i did starting in 2005. When i was on the trail i saw several henro in non-traditional garb, including some in blue jeans. Just to offer my opinion, let me say that i think all henro (yes, i mean ALL) should carry a walking stick and wear the white hakui, even if you wear no other henro related clothing. These two items single you out and let everyone know that you are a walking henro. Whether you believe me or not, this will affect your pilgrimage as just by having these two items, people will interact with you in a much different manner than if you don't have them. When people see them, they see a walking henro, as opposed to a foreign tourist, which they may or may not interact with. These items are fairly cheap — buy them. You won't regret it. While Japanese adults still do not wear shorts in public (typically), more and more shorts are appearing on the henro trail. I see them regularly now; beginning in spring 2016 and even more so through 2017. But the catch is, they wear ankle length tights underneath them. So, while you will see shorts on the trail now, you still won't see bare legs. All of the above, and much more, can be purchased at Temple 1 in several henro supply stores. One store is just outside the temple compound, by the parking lot, another is located inside the Hondō, and there are a couple of stores outside the temple compound to the left of the Niōmon gate.